Last revised 10 May 2014. 117:05:25 Cernan: Well, the next thing it says is that Gene gets out. 117:05:29 Schmitt: I don't see that. 117:05:38 Schmitt: Okay. Good heavens! 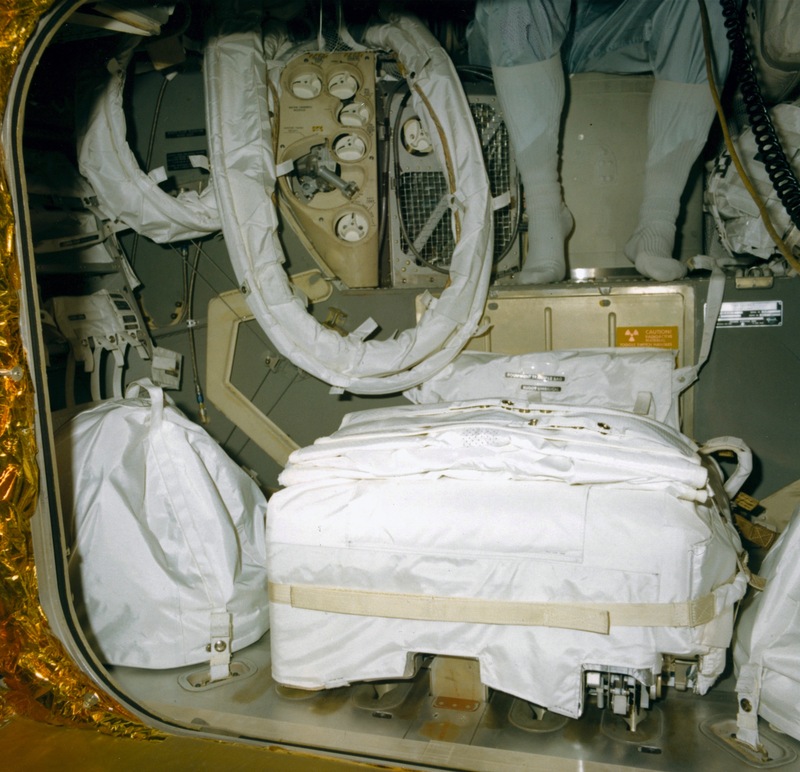 117:05:40 Cernan: That means you got to get out of the way so I can open the hatch. 117:05:44 Schmitt: Well, I'm going to have to turn around a little, I think, so I can help you. 117:05:47 Cernan: Okay. (Pause) Boy, beware of that corner. 117:05:55 Cernan: Yeah. I tell you at 4-1/2 (psi), you're really pretty heavy (means "stiff"). 117:05:58 Schmitt: What was that that came shooting up here? A piece of bread? (Laughs) Would you believe that? 117:06:04 Cernan: Yeah, I'd believe it. 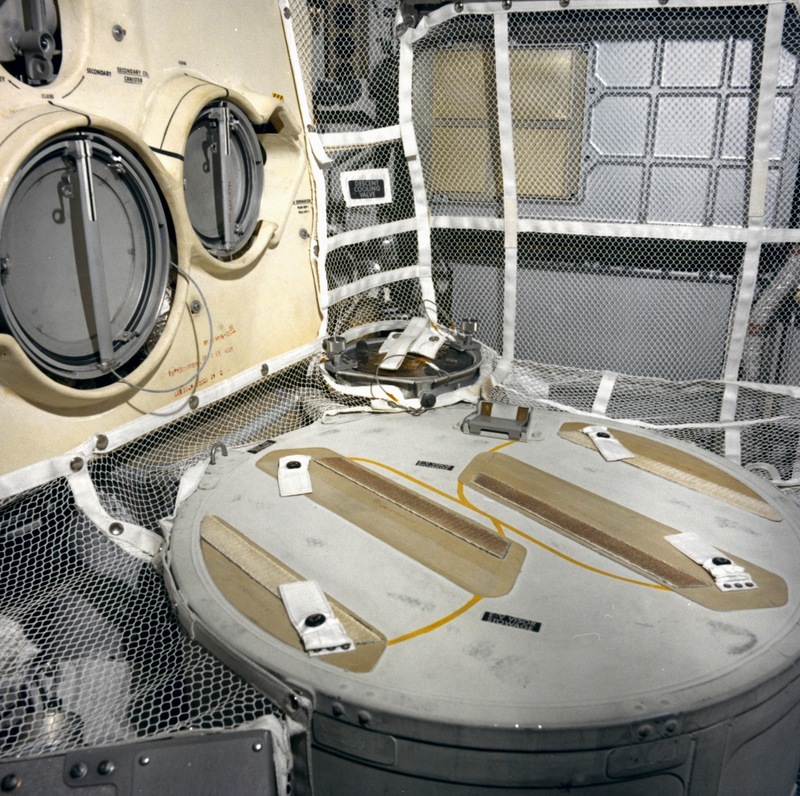 117:06:07 Schmitt: Why is our hatch open? Somebody opened our hatch. Are you getting cooling? 117:06:12 Cernan: I'm beginning to, I think. I still got a Water Flag. (But I'm) not hot. 117:06:18 Schmitt: Stand by. Okay. (Long Pause) How does the water pressure look, Houston? 117:06:46 Parker: Challenger, they're looking just a little bit low. We're still expecting them to build up. It's going to take a little while. 117:06:53 Cernan: Okay. I'm getting down on my knees out here. How am I looking, Jack? 117:06:57 Schmitt: You're just fine. I'm holding you away from the DEDA...(correcting himself) the DSKY. 117:07:04 Cernan: Okay. I'm going to put this visor down now, I think. (Pause) How does that look to you? 117:07:15 Cernan: How are my legs? Am I getting out? 117:07:17 Schmitt: Well, I don't know. I can't see your legs. 117:07:22 Schmitt: I think you're getting out though, because there's not as much of you in here as there used to be. Oh, hey, Gene, when I get down there, I got to fix your tool harness (on the PLSS). Hold it. 117:07:32 Cernan: Okay. Can you reach it? 117:07:33 Schmitt: It's come off the bottom again. 117:07:36 Cernan: Can you reach it? 117:07:40 Cernan: Oh, the bottom of the PLSS, huh? 117:07:44 Cernan: Okay. Well, my legs are out. Keep that hatch open. 117:07:48 Schmitt: Can you squat down any further, because you're hooked on...(Pause) You're making it worse. Okay. 117:08:06 Schmitt: Okay. Now, be careful because you might hook it on something down there. 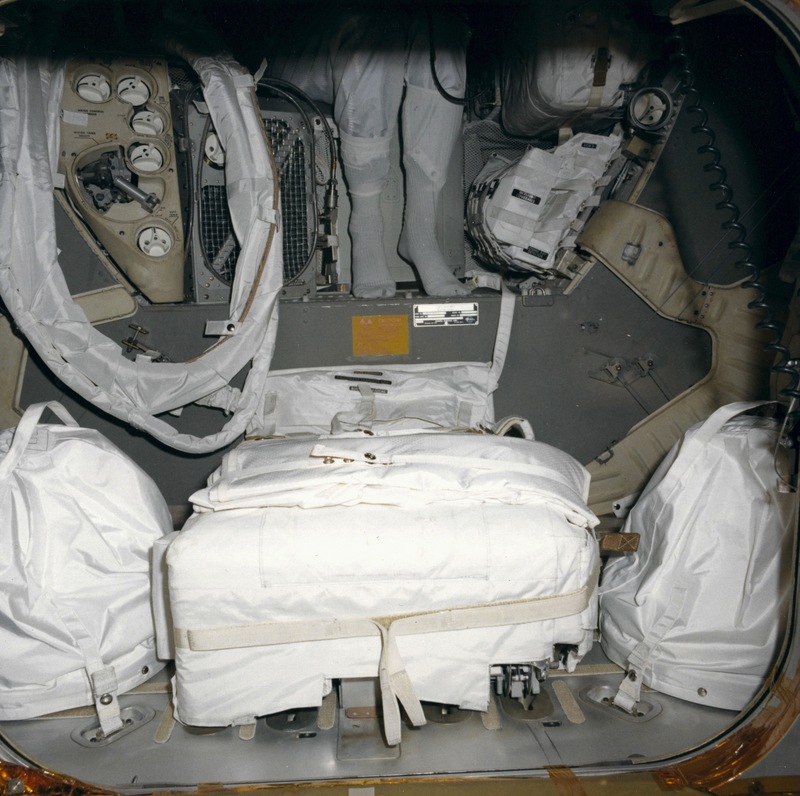 117:08:10 Cernan: Oh, the tool harness? 117:08:11 Schmitt: Yeah. The back. It's loose on your back; on the back of the PLSS. 117:08:15 Cernan: Oh, man, I don't like that. Okay. I'll watch it. 117:08:17 Schmitt: Well, I'll fix it when I get out there. 117:08:21 Cernan: (To himself) Okay. I'm still reading 4.0 (psi). Houston, the Commander is on the porch of Challenger. 117:08:33 Parker: ...now, and you're probably getting cooling. 117:08:39 Cernan: Okay. Everything else look good to you? 117:08:46 Cernan: Okay, Jack. I'm going to get the MESA (Modular Equipment Stowage Assembly). 117:08:49 Schmitt: Okay. And I'll have an ETB ready for you (as per LMP-6). 117:08:51 Cernan: (Reaching for the D-ring) Oh, man; oh, man; oh, man. 117:09:00 Cernan: (Chuckling) Okay. Here it comes. (Pause) There she goes, Babe. 117:09:10 Cernan: There she is. All the way down; it looks like. Okay. I jettisoned...Oh, you want an ETB? 117:09:19 Schmitt: That's up to you. 117:09:23 Schmitt: You're the commander. 117:09:24 Cernan: I got it! I got it. And, the (suit) pressure looks like it's started to stabilize at 3.8. I don't know whether I'm getting cooler or not, but I feel pretty good. 117:09:40 Parker: Okay. We copy that. 117:09:41 Schmitt: How about a jett(ison) bag, too? 117:10:00 Cernan: (Using the lanyard to lower the ETB to the ground) Oh, Jack, I could swing it over the - it won't be any problem - over the strut. Okay; and the jett bag is swinging free. 117:10:13 Schmitt: You mean the ETB. 117:10:14 Cernan: ETB. Oh, man. This looks like a Santa Claus bag. 117:10:22 Cernan: Oh, boy. There it goes. The Rover looks in good shape. ETB is down there. Okay. I've got all my visors down. Jack, I wouldn't lower your gold visor until after you get on the porch, because it's plenty dark out here. 117:10:42 Cernan: ...I'm on my way (down the ladder). 117:10:43 Schmitt: ...is off. Sensitivity, max and max. 117:11:30 Cernan: Jack, I'm out here. Oh, my golly! Unbelievable! Unbelievable; but is it bright in the Sun. (Pause) Okay! We landed in a very shallow depression. That's why we've got a slight pitch-up angle. (It's a) very shallow, dinner-plate-like, dish crater just about the width of the struts (meaning the total span of the landing gear). How you doing, Jack? 117:12:12 Schmitt: Fine. Getting the circuit breakers verified (as per LMP-6). 117:12:19 Cernan: The LM looks beautiful. (Pause) Oh, do we have boulder tracks coming down (the side of North Massif). Let me see exactly where we are. I think I may be just in front of Punk. 117:12:46 Parker: ...to both the north and south? 117:12:53 Cernan: (Responding to Bob's question) Okay. On the North Massif we've got very obvious boulder tracks. A couple of large boulders come within 20 or 30 feet of the (break in slope)...Looks like where we can get to them; there's a couple I know we can get to. Well, the Sun angle is such that, what I saw on the South Massif earlier, I can't see very well. But, I know there were boulder tracks over there. Bear Mountain...Boy, it's hard to look to the east (toward the Sculptured Hills). Bear Mountain and the Sculptured Hills have a very, very similar texture on the surface. The Sculptured Hills' (texture) is like the wrinkled skin of an old, old, 100-year-old man. (That) is probably the best way I could put it. Very, very hummocky, but smoothly pockmarked. I do not see any boulders up on the Sculptured Hills from here. But it's awful hard to look to the east and to the southeast. 117:13:04 Parker: Okay. We copy that, Gene. Have you got an LMP with you yet? 117:14:09 Cernan: Well, here come his feet. Jack, let me make sure...We didn't have an awful lot of dust on landing; but I can dig my foot in 8 or 10 inches, and I know we're at least that thick. 117:14:20 Cernan: There's a small little 1-meter crater right in front of us with a whole mess of glass right in the middle. That's right in front of the MESA, as a matter of fact. Right where I want to park the Rover. Jack, you're looking good. 117:14:38 Parker: Beautiful, guys; beautiful. 117:14:42 Cernan: (Gene is walking around the LM to get his bearings) I'm going to take a quick look back. I think this is Poppie, and I can give you a real better idea where we are. 117:14:48 Schmitt: (As per LMP-6) Hatch is closed, barely. 117:14:51 Cernan: Hey, Jack, don't lock it. 117:14:53 Schmitt: I'm not going to lock it. 117:14:54 Cernan: We've got to go back there. You lose the key, and we're in trouble. 117:15:01 Schmitt: Oh, I'm on the porch! 117:15:05 Cernan: Who said this place was smooth? Oh, boy! There's a lot of local depressions here I didn't figure existed. 117:15:17 Schmitt: Hey, who's been tracking up my lunar surface? 117:15:21 Cernan: Hey, Bob, I'm east of the LM now. I'm east of the LM, and the back strut of the LM is...Well, the LM straddles this crater I talked about, and that's where we get the pitch angle; the back strut is probably right down in the eastern one-third of that crater. Just a very subtle crater. 117:15:47 Schmitt: Hey, man; you had some forward velocity. 117:15:58 Cernan: Boy, I look at some of these rocks that are filleted here, Jack, and there sure are a lot of sparklies in them. Awful lot of sparklies. 117:16:08 Schmitt: You landed in a crater! 117:16:11 Cernan: That's a pretty good shot. 117:16:15 Cernan: Okay. I'm going to get to work in a minute, just as soon as I take a look at Trident (actually Poppie). 117:16:18 Schmitt: Why don't you come over here and let me deploy your (PLSS/OPS) antenna (as per CDR-6 and LMP-6). 117:16:22 Cernan: Okay. Just walk around for one second. 117:16:25 Schmitt: (Laughs) Hey, man, put your visor down. 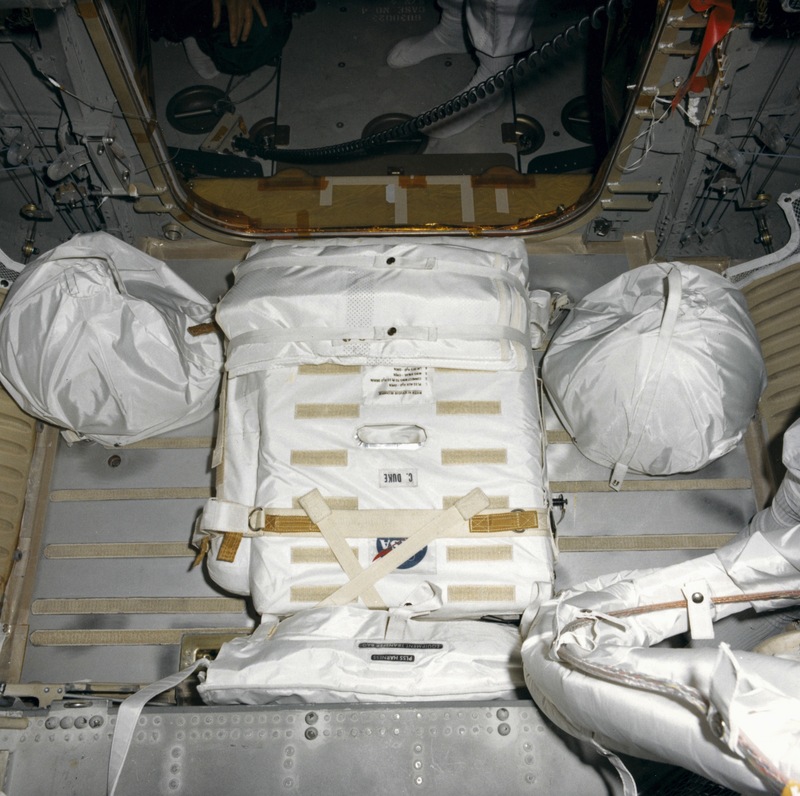 117:16:30 Cernan: And, I'll be over there, and you can fix my tool harness. I don't like that thing loose. 117:16:35 Schmitt: I don't like it loose, either. What are you doing over there (by Poppie)? We're supposed to be working. 117:16:39 Cernan: I was just going to give them a fix (meaning another estimate of where they landed). All these little craters, Jack, have got glass in the bottom of them. Here's another one. 117:16:46 Schmitt: (To Houston) There's very clear sweeping of the surface by the descent plume out, oh, about 10 meters. No, 15 meters. (Pause) (To Gene) Come over here, and I'll fix your antenna. 117:17:10 Cernan: Okay. Hey, Bob, how big is Poppie supposed to be? 117:17:19 Cernan: I didn't hear you. You cut out. 117:17:21 Parker: Okay. It looks on the map like it's about 75 meters in diameter. Fairly subtle. 117:17:28 Cernan: Okay. Okay, I tell you where I think I landed...Oh, about 100 meters from Poppie at 10 o'clock. 117:17:38 Schmitt: You think that's Poppie, huh? 117:17:41 Schmitt: That's an awful big hole. 117:17:48 Schmitt: It might be part of Trident. 117:17:49 Cernan: ...get your antenna. Get your antenna. Oh, a little more. (Pause) God, it's beautiful out here. 117:17:57 Schmitt: Well, hang on. 117:18:06 Cernan: Not yet. Yeah, you talk to them. I don't want you to stand up yet. 117:18:11 Schmitt: The surface is moderately cohesive, which holds a pretty good bootprint. Very fine-grained. Gene's (garbled) looks very much like previous soils (that is, soils at other Apollo landing sites). (To Gene) You got it? 117:18:26 Schmitt: You got a hole behind you now. 117:18:28 Cernan: Well, I'll stand in it, and you can get at it better. 117:18:31 Schmitt: Well, you got me right in (that is, facing) the Sun. Can you come around this way? Ho-ho. (Laughs) I'm going to have to get upstream of you. 117:18:43 Cernan: Look, you get up on the hill, and I'll get in the hole. 117:18:45 Schmitt: Yeah. There you go. Whoa, whoa, whoa, whoa. 117:18:51 Schmitt: (Finishing the thought) Walked on the Moon, huh? Well, I tell you Gene, I think the next generation ought to accept this as a challenge. (Pause) Let's see them leave footsteps like these someday. Got another...Well, that'll be all right. 117:19:12 Cernan: Okay. What did you do with my tool harness? 117:19:15 Schmitt: I'm going to work on it; that's what I'm going to do. (Pause) Whoa; hold still. 117:19:33 Schmitt: Well, let's see. How's this thing...I'm going to have to loosen it. 117:19:37 Cernan: Well, if you could just stretch it around. 117:19:39 Cernan: You can't, huh? 117:19:40 Schmitt: But I will be in a minute. 117:19:42 Cernan: Don't loosen it to the point where you can't get it back on. 117:19:45 Schmitt: Won't. (Pause) Okay. You're almost reconfigured. 117:19:59 Schmitt: Okay. (Pause) Somebody tied you on wrong, too. They've got the strap reversed for the Velcro. Okay, Gene. I think that'll hold. 117:20:17 Schmitt: If it doesn't, I'll fix you again. 117:20:20 Cernan: Man, there's sparklies in the soil, Jack. You can just look at it. See them all over? Very fine-grained. It's sparkly, that's all. Bob, I'm going to Min cooling...(correcting himself) or, intermediate cooling. 117:20:33 Parker: Okay. Copy that. 117:20:36 Cernan: See the soil sparkle? 117:20:40 Schmitt: Yeah, I think that's little (pieces of) glass. 117:20:43 Cernan: Let's go back here and get to work, and I'll show you that crater that's got nothing but glass in the bottom. 117:20:47 Schmitt: That's a vesicular rock of some kind there, Geno. It almost looks like a Mono Craters (California) pumice, but don't quote me. 117:21:13 Cernan: ...with the dark mantle. 117:21:16 Schmitt: And that sweeping by the descent stage goes all the way out there, Houston, to where we were; which was about 50 meters, I guess. Hey, man...(Jack stumbles) Whuh, whuh, whuh, whuh. Hey, these rocks, they almost have a very light pinkish hue to them, and they're not obviously breccia. Now, that's like a breccia there. But this is something else again. 117:21:50 Cernan: Yeah. I don't think there is any place you could land around here where you wouldn't have one foot(pad) in a crater. 117:21:54 Schmitt: Looks like a vesicular, very-light-colored porphyry of some kind; it's about 10 or 15 percent vesicles. I'm right in front (that is, west) of the LM. Quite a few of the rocks look of that type. Sort of a pinkish hue to them. The texture is coarse, but I'm not sure how crystalline they are, yet. 117:22:24 Cernan: Okay; back to work. Jack, when you put up the ETB (on the MESA), check down there below it. 117:22:33 Cernan: Okay, let me take a look at the Rover. 117:22:35 Schmitt: Let's don't forget those (scissors). 117:22:39 Schmitt: That's my fault; I guess (for not packing the ETB carefully enough). 117:22:44 Cernan: Oh man, I tell you, we came down at just a little forward velocity. Look at that, right there. About a (one)-foot slip on the pad. I tell you, there's craters all over here. Okay, baby. I'd sure like to think that that (Rover) wheel is where it's supposed to be. It looks good to me. (Pause) Our next little vehicle to work. (Long Pause while Gene examines the Rover, using cuff checklist page CDR-7 as a guide) Okay. Bob, so far, the Rover looks pretty good. 117:23:39 Parker: Roger; sounds good, Geno. 117:23:44 Cernan: (To Parker) Hey, let me ask you. When I was behind the LM, I could look right into an area and see the bell of the ascent stage. I never realized that before, but I guess that's normal, huh? 117:23:55 Schmitt: Yeah; We saw it on the (launch) pad (at the Cape). Remember. 117:24:00 Schmitt: Remember when we went out there? 117:24:05 Cernan: The only reason I asked, Bob, I'm sure it's normal, and it doesn't look anything's missing, it's just right into the Sun. 117:24:13 Parker: Yeah, the consensus of opinion down here is that you can, also. 117:24:20 Cernan: Well, that's probably the best place in the world to get a consensus of opinion from. Okay, Jack, it's about work time. I've got this Rover about ready for your pull up there. 117:24:33 Schmitt: I got a little delayed here. 117:24:35 Cernan: Okay. (Pause) I'm sure glad those guys made us train so hard.